Last weekend Joshua had to meet up with a fellow Mercedes lover to buy some wheels for his car in San Francisco, so Dani and I accompanied him which turned into a shopping day! We went to Westfield SF for lunch and to look around at the different shops. I visited the Tory Burch store and bought her fragrance; it was also cool to finally see the FitBit bracelets in person. We explored a couple shops outside the mall, and purely by accident we stumbled upon a diptyque shop. I’ve seen their candles floating around the blogosphere/Pinterest, mainly empty candles being used to hold make-up brushes, and had been considering getting one, so it was nice to see the candles in person and actually smell them. I went home with Violette and Dani got Mimosa, both which smell SUPER good! On our way home we passed through Marin and did a quick drive-by of my grandpa’s old house, and we stopped at Mary’s Pizza Shack for dinner. Sunday was my first yoga class of the week. Dani and I went to Holy Yoga in the evening, which was basically doing yoga and worship. It was pretty neat, especially since we went to church earlier in the day, so it was a nice way to wrap up our Sunday. I went to two additional yoga classes during the week. The one I went to on Tuesday evening was a donation class, so donations went to the Sweet Dreams Foundation which builds dream bedrooms for kids with life threatening diseases. Then I went to another Rise With the Sun class on Thursday. Friday evening Joshua and I went out with Dani and her friends to celebrate the enagement of Danielle and Adam. We to Chicago Fire for dinner and wrapped up the evening at Cold Stone Creamery. This week I worked on a couple different projects. I did some more designs for the Swansons app, created some cover photos for Mikuni’s Twitter and Facebook pages (which they haven’t put up yet), worked on the upcoming new design for The Kitchen and Iron Horse Tavern, and began wireframing for Capitol Morning Report. Also my lifestyle photo finally was added to Three29’s website. 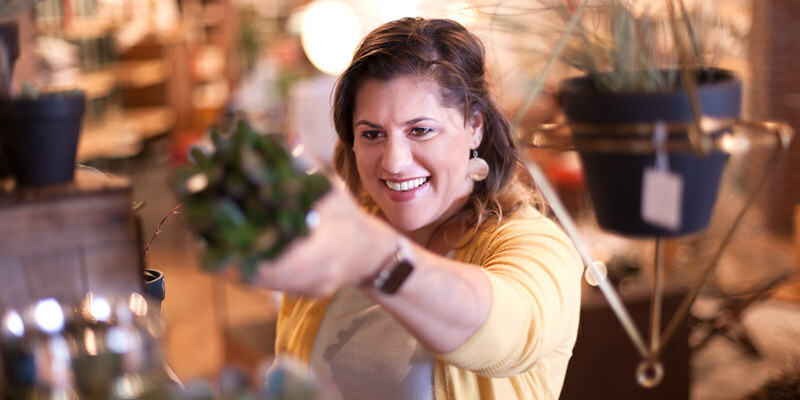 A couple weeks ago I did a photoshoot with Kevin Fiscus at West Elm which he photographed me shopping. The idea was to show me doing something other than what I do for a living, and since I keep this blog here of my domestic adventures it made sense to have a photo of my shopping at one of my favorite stores. And in case you’re wondering, in my photo I am look at a succulent. I continued work on the mood board, playing around with some pattern designs, but that was about it for progress.